The type I interferons are cytokines produced by mammalian cells in response to virus infection. 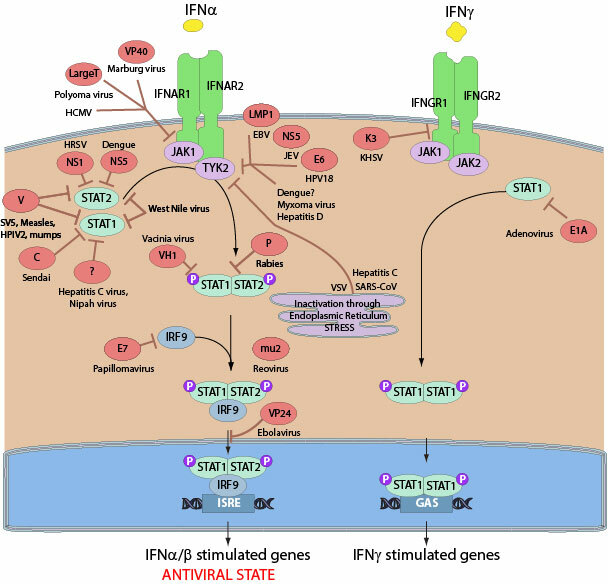 IFNs exert antiviral function by binding to the IFNalpha/beta receptors on the cell surface, and thereby activating the JAK-STAT signaling cascade. The outcome of the pathway activation is the establishment of an antiviral state in the cell characterized by the expression of hundreds interferon-stimulated genes. Many viruses modulate the interferon signaling pathway by inhibiting the cellular proteins participating in this cascade. They can interfere with basically all the components participating in the expression of interferon-stimulated genes including STAT1(M97935:9606), STAT2(M97934:9606), JAK1(M64174:9606), or TYK2(X54637:9606).